Dready Berry is a mostly Indica F1 hybrid of a Blueberry and a White Widow. 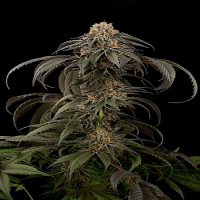 Dready Berry Feminized Marijuana Seeds by Dready Seeds: Dready Berry is a mostly Indica F1 hybrid of a Blueberry and a White Widow. With the intense taste of the White Widow and the aroma of the Blueberry, bred for a delicious, fruity taste and fragrance. It has since been further backcrossed into the original Blueberry to create a more stable and pungent Blueberry dominant strain. In low outdoor temperatures this plant displays autumnal colours, turning from blue to purple and even multi colours when the temperature drops even lower. Outside Dready Berry can reach up to 3m tall. The height and aromas of the Blueberry mother and the high resin production and sedative power of the White Widow father ensures a substantial, impressive yield. 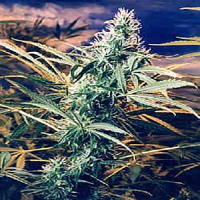 It is a good producer of fat, blue tinted buds, totally covered with crystals with a fruity taste and a very nice strength high. It withstands well when grown in a warm, humid climate. Where it can develop its full aromatic potential and good looks that make this strain a favourite for medicinal users and extract artists. It shows good mold resistance but extra care is recommended during the last few weeks of flowering, because the size and density of the buds increases significantly and can lead to the appearance of bud rot (Botrytis).